Information security is a hot topic amongst all the IT experts these days, and they all tell you the same thing. Protect your information. 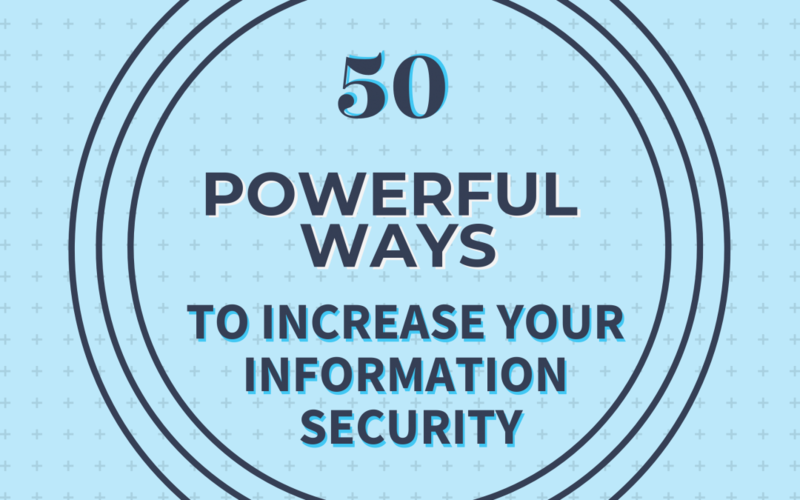 Improve your information security. Prevent data breaches. Look both ways before crossing the street. Yawn… but seriously, it is super important. With over 500,000 Australian businesses falling victim to cyber attack last year, there is a great chance your business could be one of those statistics for 2019. So we’re here to provide you with a whole lot of excellent strategies you can implement to increase your information security, and protect your business. This year the Internet of Things (IoT) has exploded. Old devices are becoming smart, everything is talking to something, devices and software are turning up in places we never thought possible in recent years. The latest Australian Notifiable Data Breaches scheme and the European GDPR now both at play businesses need to implement mitigation strategies more than ever. Information security is a part of cyber security, but the two are not interchangeable. It refers more specifically to the actual processes and tools that focus on preventing sensitive information from falling into the wrong hands. 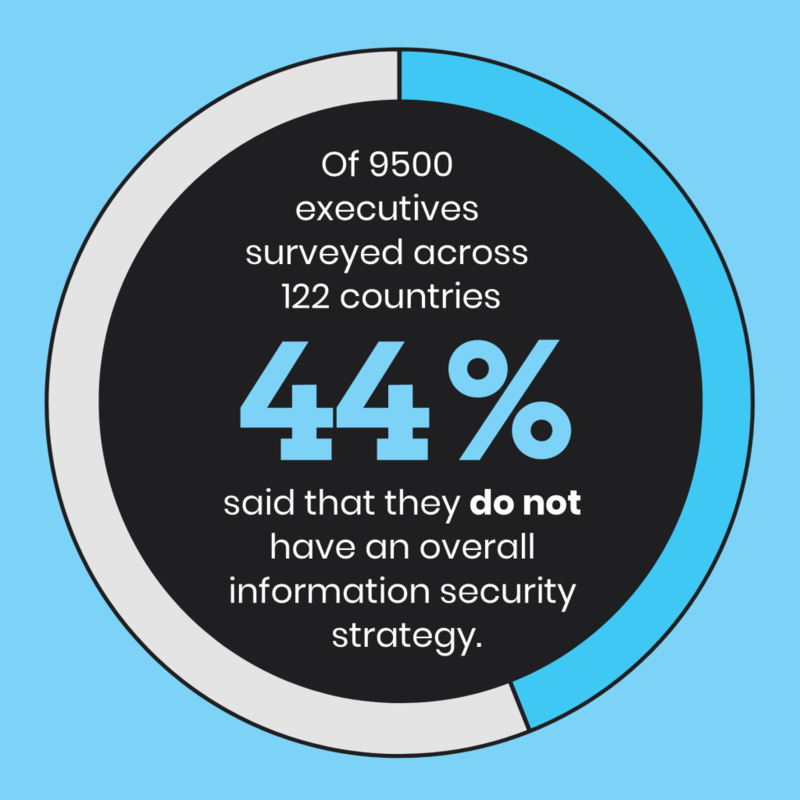 This means that information security is ultimately about risk management. Ensuring high-value systems are not breached, such as computers, servers, email platforms and networks — interruptions to these can bring the whole business to a grinding, expensive halt. Ransomware takes your data hostage in exchange for a ransom payment (usually demanded in cryptocurrency for anonymity). Without the decryption key, your information is completely inaccessible. The attacker will threaten to destroy or expose the data if their ransom demand is not met. Phishing attacks are the culprit for so many malware attacks. Malicious attacks disguised as trustworthy emails and links that entice you to enter your personal information. Voila, the dummy site now has your username and password — and you might not even realise. A Distributed Denial of Service (otherwise known as DDoS) is an attack that essential floods your network with traffic until it can’t function. Your computer can be hijacked to participate in one of these attacks, and you wouldn’t even know it. These refer to any type of fraud scheme that uses email, web sites, chat rooms or forums to present fraudulent solicitations to prospective victims. They are not always obvious and can range from dating scams to fake shopping websites and get-rich-quick offers. A malware program that catches your data presents a huge risk to your information security. These are almost always introduced to the system through an email attachment or an unsafe download. Once installed, these programs comb your system and steal critical data that can leave you personally exposed. Similar to how the DDoS attack hijacks your system to provide computing power, attackers are utilising crypto-mining malware to exploit remote computers. They use your system’s processing power to mine cryptocurrency, which cripples your system and puts your information at risk. Whether through malware, or phishing, on your phone or computer — internet banking fraud can lead to having your money illegally withdrawn from your account to someone else. Despite the convenience and ease of mobile banking, attackers still focus on tricking victims directly to reveal confidential information. Implement a multi-factor authentication system across all systems that can offer it. Seems like overkill? It’s really not. Requiring only a password for access means you are just one security measure away from your information being compromised. 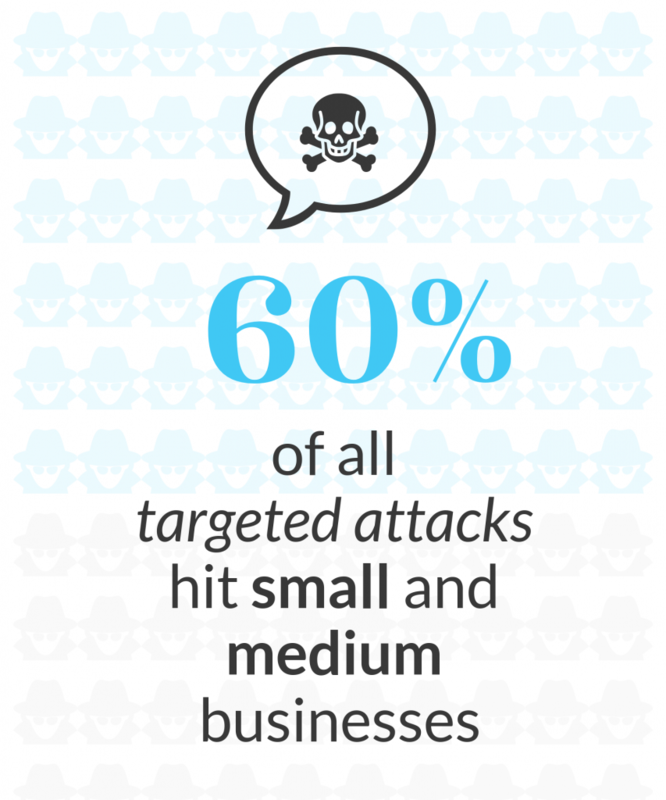 If any of these are compromised, your business will severely suffer. To get the ball rolling on this, log into each system and set up any default MFA processes. If you are looking for a central way to manage it, look at Okta. They have a range of identity management solutions including single sign-on and multi-factor authentication. For your personal devices, consider Authy. Administrative accounts should be restricted to operating systems functions and relevant applications (that are required for work purposes). With administrative accounts restricted from internet access and emails, they are secure against phishing attempts and malware links. If someone gets their hands on an administrative account, they could wreak an enormous amount of damage and access all the sensitive information. This means Windows, MacOS, iOS, Android and yes, even Linux. Don’t forget all devices on the network or cloud as well. Operating systems are written with the best of intentions but unintended vulnerabilities in the code may not be discovered for some time after release. Often they are discovered when some opportunistic villain exploits said vulnerability and everyone has to scramble to patch the OS. In other words, patch your system as these updates roll out; they will save you a lot of pain. A whitelist of your approved applications ensures that no new or malicious software can execute or install. Any software that comes from outside of your ‘whitelist’ could be infected with malware, or be otherwise unsafe. For the same reason we encourage you to update your operating systems, we advise you to keep your whitelisted applications up to date as well. These friendlies can turn foe if a vulnerability is found and exploited by malicious parties. Keep them up to date, and prevent a breach. Basically strip out unnecessary software and add-ons on your system computers and mobile devices to make applications more secure. Configure your web browsers to block ads and Flash (or uninstall it completely). Applications like Flash and Java have a bad history with security problems, so we advise you get rid of them completely if you have no need of them. This step probably seems a little out of place, but it’s an essential one. Microsoft Office macros can be used to deliver and execute malware on systems. So, we block Office from executing macros from the Internet, and permit macros from trusted sources (or those with a digitally signed trusted certificate). If you have an incident where your data is compromised, corrupted or destroyed, you want to be able to access that information relatively quickly. Schedule daily, or frequent backups of new, important or critical data. You should test them on a regular basis and consider a retention period of at least three months so you can go back in time to recover lost files. Store multiple copies of your back up in different locations. Implement a mobile device management solution within your business. There are numerous MDM tools you can use, and many have their pros and cons — but ultimately they work to secure your company data, and your employee’s personal information. A good MDM tool allows you to provide your staff with access to business apps and data on mobile devices without requiring individual device enrolment. Similar to, but not to be confused with mobile device management! MAM is a management tool that has evolved to suit a culture of ‘bring your own device’ in the workplace. Instead of managing an entire device, Mobile Application Management is about managing and controlling required apps on a personal device, where you control the permissions and security. We advise you to enable and enforce email security measures such as SPF (Sender Policy Framework), DKIM (Domain Keys Identified Mail), and DMARC (Domain Message Authentication Reporting and Conformance). These measures protect you by verifying email senders and recipients to prevent any malicious emails coming in or out. Make sure that your company has a clearly defined set of policies and processes for transferring money, and handling payments to reduce any risk of financial fraud or breach. Set up automatic and dynamic scanning for email and web content with sandboxing to protect your system. Sandboxing isolates programs so they aren’t able to spread any potential issues to the rest of the network. More techno-babble, sorry. Apply TLS encryption to your email servers for added protection. TLS stands for Transport Layer Security, and is basically a cryptographic protocol that encrypts communication to make it secure! Ensure that you disable local admin passwords across all computers and servers — this ensures that administrative functions cannot be accessed anywhere and reduces the risk of compromise. This is a step you probably want to engage after you’ve done your vulnerability scans and cyber security auditing. Penetration testing is a next level step to test how secure your system really is, what weaknesses and entry points there are. Make sure to only use an organisation that has been certified by CREST Australia (Council of Registered Ethical Security Testers). Common sense tells us to reduce or remove access to any applications, processes or services that we don’t need. We saw this with application hardening and whitelisting. Cloud services fall under this rule too. Having a business continuity plan in place means that in the event of a disaster (of any sort), your team is adequately prepared and knows what actions to take without hesitation. Keep a physical copy of the plan in a secure location. If your team works remotely, or on the go, make sure that they don’t resort to using public WiFi. Public WiFi is inherently insecure, and puts your information at risk. Instead, provide them with portable connectivity they can use on the go. Your email platform will come with built-in security features, and we advise you take full advantage of them! Email is such an easy, common target for cyber criminals since every other account you hold on the internet can pretty much be reset through your email. If they have access to your email, they can easily access other systems, or send malicious content to your contacts who won’t realise you’ve been hacked. An incident response plan gives your team a set of steps to follow to manage and mitigate any data breaches or other incidents. Tailor the response plan for data breaches and information security. If you’ve got a framework implemented, then it should also provide an incident response plan for you to follow. If not, then get that framework happening! Do they have relevant experience? Review examples of their work if possible. Their first priority should be a cyber security audit/risk assessment — not just selling you a one-size-fits-all software solution. Will they communicate and be transparent with you? Can they provide training for your staff? Are they able to provide a tailored plan for your business? In contrast to anti-virus applications, hardware security describes physical hardware devices that provide vulnerability protection. Examples include hardware firewalls and hardware security modules. These devices provide an additional element of protection to your network. So much of the steps listed above come down to one thing: risk management. Once you understand information security and the risks that threaten it, you ironically reduce that risk. Being on the ball means you recognise threats and know how to prevent them. This one is so obvious that its easy to miss. Protect your WiFi by ensuring it’s secure, encrypted and hidden so that your network is not waving a big ol’ flag to any passing hackers. Change the router password, use WPA2 encryption and keep the firmware up to date. Whatever Content Management System (CMS) you’re using, there are likely ways to improve its security. So many CMS attacks happen through front-end login. Remove front-end login for anyone who needs to access your CMS (back-end access instead), change default admin accounts, and be wary of plugins. It’s never safe to assume you are 100% protected. That leads to complacence. Complacence leads to weaknesses. Which leads to the dark side, etc etc. Information security is about the journey, not the destination. You should be constantly evaluating, revising and updating your policies, software and permissions. Assume someone is always looking for that one tiny loophole in the system. Whew, that was a big list. If you made it all this way, you must have been really keen for some information security tips. Our team is even better to be perfectly honest, so it’s okay if you’re feeling bewildered about all the information coming at you. If you’re a bit concerned about the information security within your organisation, then please don’t hesitate to get in touch with our amazing team at Stanfield IT. This is what we do, and we’ll get you where you need to be. Have a look at our case study here to see how we’ve assisted our clients in exactly this area.